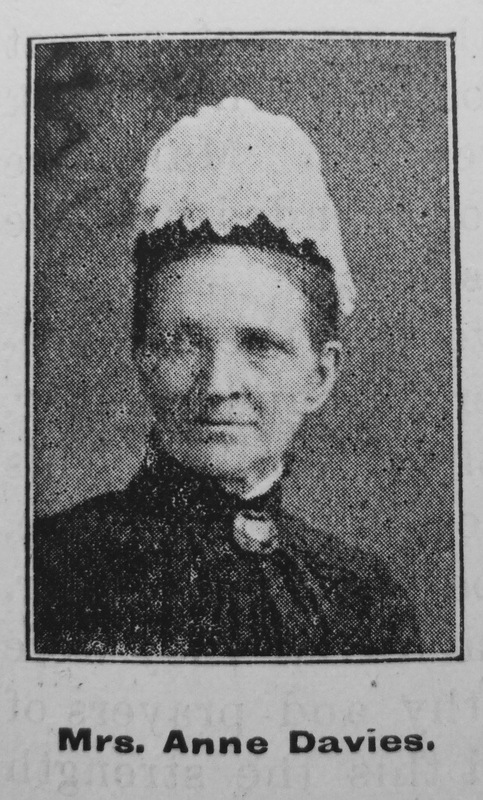 In 1876 she went to reside in the Kidderminster Circuit, where she was actively employed in the Lord’s work for twenty years, fifteen of which were spent in connection with the Town Society. For the last six years she has been residing at Cleobury Mortimer, in the Ludlow Circuit, where she attended the means of grace as often as her failing strength would allow. After a fortnight of very severe suffering, and when all that medical skill and domestic affection could do proved unavailing, she peacefully passed away from her dear husband and three daughters on May 21st, 1902. While on her death bed she charged those dear to her to meet her “at home”; and often prayed for release from her sufferings, and longed to join the loved ones who had gone before. Her favourite expressions were:- “My precious Saviour”; “Come, Lord Jesus, come,” etc. Her remains were laid to rest in Kidderminster Cemetery, on May 25th, when many friends attended to pay their last tribute of respect. The choir sang two of her favourite hymns – “There’s a light, in the valley”; and “Jerusalem, my happy home.” The Rev. D. Oakley alluded to her happy death on the following Sabbath, to a large congregation in Kidderminster new Church. For twenty-seven years the writer has intimately known the deceased, and during that period he spent four ministerial terms on the Ludlow and Kidderminster Circuits, and in connection with three of those terms Mrs. Davies was one of the most active workers in the church. Especially at Kidderminster: she threw all the energy she possessed into the sewing meetings, to extinguish the debt on the old chapel, and so prepare the way for the present structure. How she prayed and worked for the new church; and though this was completed and opened before her departure, yet being unable to be present, she exclaimed – “Lord, now lettest thou Thy servant depart in peace.” While Heaven is the richer, earth is the poorer, for her removal. May her dear ones all gather with her in the celestial clime. Anne married William Davies (abt1831-1920), a farm labourer, in early 1860 in the Clun Registration district, Shropshire. Census returns identify four children.